 This Article responds to two critiques of postmodern legal scholarship published by Dennis W. Arrow in the Michigan and Texas Law Reviews. 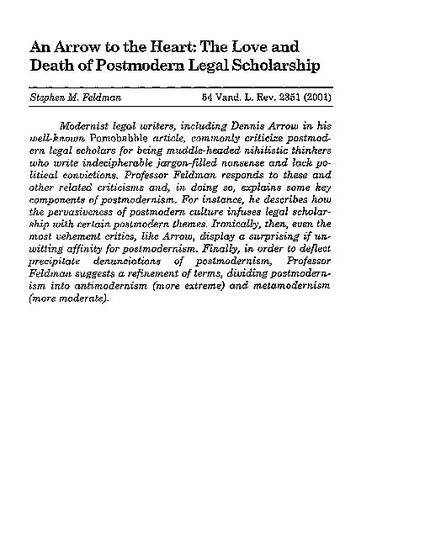 Arrow raises the modernist criticisms that are most often leveled against postmodern legal scholars. If Arrow and the other critics were to be believed, postmodernists are muddle-headed thinkers who write indecipherable jargon-filled nonsense. Even worse, they are irresponsible nihilists who lack political convictions. Such criticisms of postmodernism are unpersuasive because the typical modernist depiction of postmodern legal thought is seriously inaccurate. It is little more than a caricature.The modernists, in other words, are imprecise and downright wrong. Now, some of the critics, including Arrow, might be smiling and thinking their response: 'Aha! You can’t even use the word ‘wrong’ without contradicting yourself because, after all, you’re a postmodernist. And postmodernism repudiates concepts like truth and falsity, and rightness and wrongness. And precision. How can a postmodernist demand precision with a straight face.' But this modernist response is precisely the problem. The typical modernist characterization of postmodernism - as rejecting all conceptions of rightness, goodness, and judgment - is wrong. And I use that word again purposefully to stress that concepts like truth and falsity, rightness and wrongness, and so forth are entirely consistent with postmodernism. Indeed, as explained in this Article, postmodernism explains how we understand such concepts in the first place.